Benoit Robin aka Hobz or Mr Hobz is a French contemporary artist born in 1978. 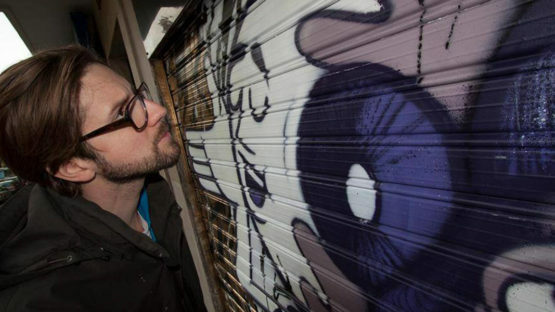 Active in the Parisian graffiti and street art scene since the mid-90s, Hobz graduated in design from the Creapole, Paris. Inspired by the pop culture masterpieces such as Conan the Barbarian, Terminator, Supervixens and Franco-Belgian comics magazine Fluide Glacial, Mr Hobz developed a dynamic graphic identity in the world of design and interior architecture. His background in design led him to an original universe represented by hand-drawn characters with pure shapes and expressive force which contribute to distinguishing Hobz’s artworks from the others. In 2001, Hobz created the Studio TRBDSGN (also pronounced Turbo design) with his friends Onde and Honda. The three friends have united their street culture and diverse experiences in order to create their own artistic universe. TRBDSGN fused graphic design, graffiti and product design in a truly stunning way of work. The ability of Hobz and his colleagues to get the best from the distinct backgrounds enables them to integrate knowledge and bring something new to the fields in which they operate. TRBDSGN crew held their first exhibition at Galerie Kitchen 93 in Bagnolet, in 2005. Mr Hobz’s work has been included in many solo and group exhibitions, at Centre Culturel des Finances, Paris, Galerie GHP, Toulouse, Galerie Kitchen 93, Bagnolet, mmartproject, Paris, Pol’n Gallery, Nantes, and Palais de Tokyo, Paris, amongst other places. Hobz lives and works in Paris, France.